The main thing that separates a Planeswalker from a conventional mage is the ability to travel between worlds. Normal denizens of Tarkir, Theros, Ravnica, and everywhere else in the Multiverse are stuck at home forever. Planeswalkers can leave. It is ironic, then, that the spark should ignite inside of Nissa Revane. 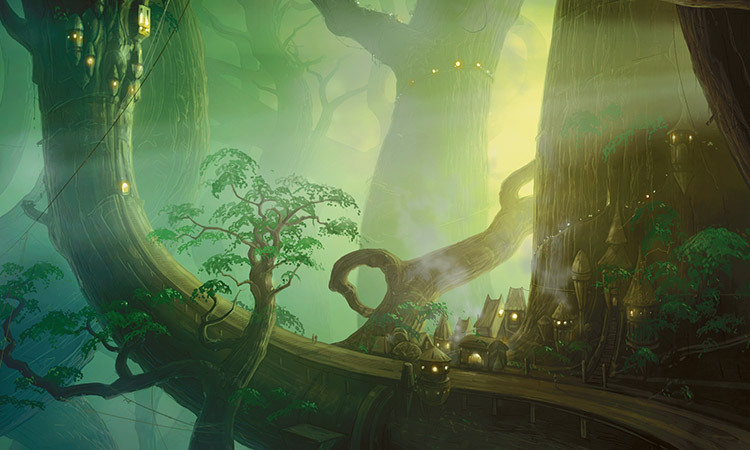 As an animist of Zendikar, Nissa's tie to her home plane goes beyond that of even a druid. Her soul speaks to Zendikar, and the land is as much a part of her as the blood pumping inside her veins. I spent a lot of time thinking about my own connection to the land as I drove from Los Angeles, California, to Wilmington, North Carolina, last week. Without being able to planeswalk there, the journey to my new home took me the better part of four days. Mile after mile, the stark beauty of the American West faded into the dry grass of the southern plains before finally giving way to the humid forests of the Eastern Seaboard. When people ask me where I'm from, it often takes me a moment to formulate an answer. Am I from California, the state where I was born and the place where I've spent the majority of my adulthood? New England, where I spent most of my childhood and adolescence? North Carolina, where an empty house with freshly painted walls beckons for my wife and I to begin our new life together? In truth, the answer is far more complex than that. There are a dozen meaningful places in the world that my mind could recreate in vivid detail, were it required of me. The mountains of the wild Sierra, where I went camping with my father as a boy. The roof of the apartment building I lived in when I was in college. The creek behind my childhood home. A suburban backyard in North Hills. These lands may not speak to me as directly as Zendikar does to Nissa, but they do imbue me with a very real kind of magic—a sense of purpose, of place, of being perfectly at home. If I were a Planeswalker, these are the places I would tap for mana. When I'm not in one of my places, I can feel as adrift as Nissa was upon finding herself in Lorwyn for the first time. This is part of why I feel so strongly about which basic lands I include in each of my decks. In the world of Magic: The Gathering, almost all of a Planeswalker's strength comes from their connection to the land. This concept is seen as a mechanical contrivance by most who play the game—the ability to cast spells has to come from somewhere, after all—but I like to think of it as one of the game's most essential components. No matter which color of mana you want to use, it is impossible to be an effective Planeswalker without a connection to the world around you. Isn't that beautiful? Of course, Nissa knows that you can use your connection to the land for a whole lot more than just tapping for mana. And during Nissa Week, we're going to find out how. Nissa has been depicted on three different planeswalker cards so far. Nissa Revane, from the original Zendikar set, rewards you for having a bunch of other Elves in play. While I might make a deck featuring her at some point, I'd rather focus on the other two for now. Not only do Nissa, Vastwood Seer and Nissa, Worldwaker do a better job of evoking Nissa's current lore, they are also among the most powerful cards that have been printed over the past couple of years. Both of these versions of Nissa encourage you to play a bunch of lands, turn them into giant Elementals, and smack your opponents with them. Sounds like a good start for a flavorful brew to me! These are all really solid ramp spells, and they do a good job of evoking Nissa's extensive travels while connecting with Zendikar. Your spell mastery should be turned on fairly often in this deck, too, since it has a lot of early game ramp and very few creature spells. These four Nissa-related cards provide some much-needed support and give us another reason for wanting to play so many lands. It's worth noting that we'll need a couple of Mountains in order to cast Zendikar Incarnate, but with the amount of ramp we're running, it won't have to be more than a couple of sources. That's fine—Nissa spent some time up in the Teeth of Akoum, but I doubt it's her favorite place to hang out. With the right draw, this deck can kill very quickly. Rude Awakening is going to be your go-to win condition most of the time, but Kamahl, Jolrael, and both versions of Nissa can do it as well. While these three legends never had the chance to meet up in the story, I like to think they would have gotten along. Both Kamahl and Jolrael spent large sections of their lives living alone in the deep woods, and Nissa would certainly relate to that choice. Many of the best stories that this deck can tell play out when Sword of the Animist is in play. It's fantastic when Soul of Zendikar or Zendikar Incarnate comes to Nissa's rescue, but it's even better when they're wielding Sword of the Animist. I love the idea of the land itself coming to life and summoning more of its friends! The key card in this deck is Horn of Greed. If you can get a couple of those going along with Exploration and Oracle of Mul Daya or Azusa, Lost but Seeking, you'll be able to draw and play several lands each turn. Couple that with a Lifegift or two and you can start to pull away even before you get them with Rude Awakening. Flavor-wise, Horn of Greed is wonderfully on-point. Even though the flavor text on the card belongs to the evil Volrath, the art depicts a twisted version of a horn of plenty—that weird-shaped fruit basket that shows up on sales flyers around Thanksgiving. Historically, the horn of plenty has symbolized the bounty of a rich harvest. Horn of Greed subverts that idea, promising your opponents riches beyond measure . . . right up until the land itself rises up and kills them. How awesome is that? Mechanically, my favorite win condition in this deck is Meloku the Clouded Mirror. With enough land acceleration in play, you can start bouncing your lands with Meloku each turn and then playing them to gain additional Lifegift and Horn of Greed triggers. While I doubt Nissa would enjoy hanging out with the Wizard who helped start Kamigawa's war against the spirit kingdom, the interaction here was too juicy to pass up. From a basic land perspective, there's only one real choice. This is a Nissa deck, so all the lands should be from Zendikar. I love John Avon's Forest #246 the most, but Vincent Proce's Forest #249, with the tree growing out of an inert zendikon, helps foreshadow Nissa's coming journey very well. For mountains, I'd go with Avon's depiction of the Teeth of Akoum. In the version of the deck that runs Islands, I'm partial to Jung Park's Island #235, since it shows the land at water's edge. That's more likely to be territory where Nissa spent some time, at any rate. Since the Islands are for Meloku only, though, you could also choose to go with Champions of Kamigawa #293, which depicts Minamo. Deck building is fun and all, but I think it's time to go for a walk around my new neighborhood and start establishing my connection to the land. After all, that's what Nissa would do.